My sissypoo and her boo got me a meat grinder and sausage stuffing attachment for my KitchenAid last Christmas, as well as a book on making sausages. I’ve been contemplating what kind of sausage would be the one to pop my sausage-making cherry ever since. 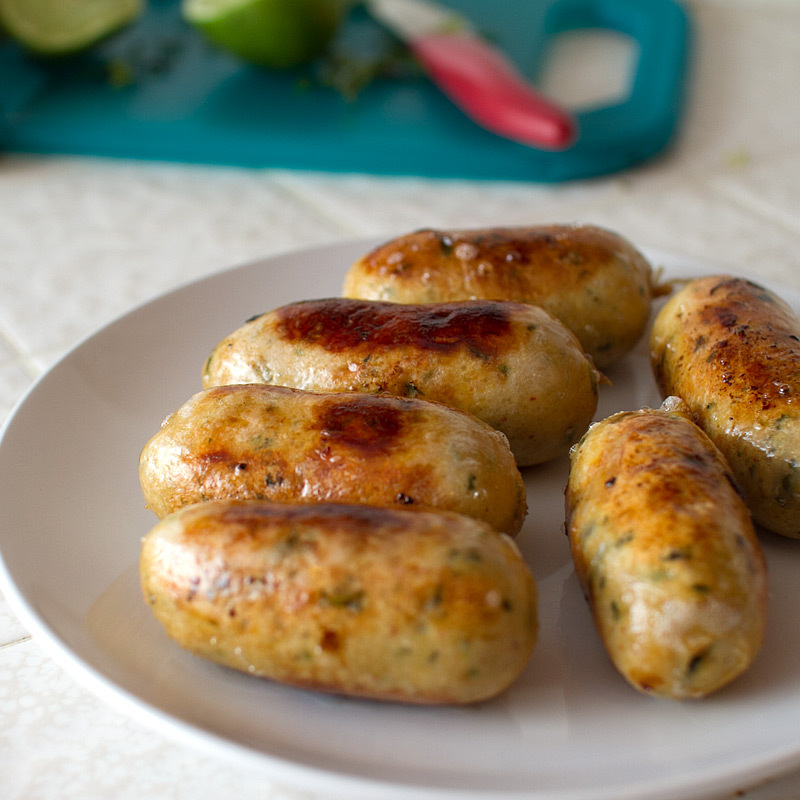 Finally, one day it came to me – Thai flavors in a chicken sausage! I did a lot if research about which cuts of chicken to use for sausage, and most suggested using boneless, skin-on chicken thighs, since chicken breast tends to dry out quickly when overcooked. But, I just bought a metric ton (read: 4 lbs, that’s a lot for me) of fresh chicken breast and I was determined to use it. After a bit more research, I found that when using a lean meat in sausage, you can use “fat replacements”, in place of the natural fat the meat would usually contain. 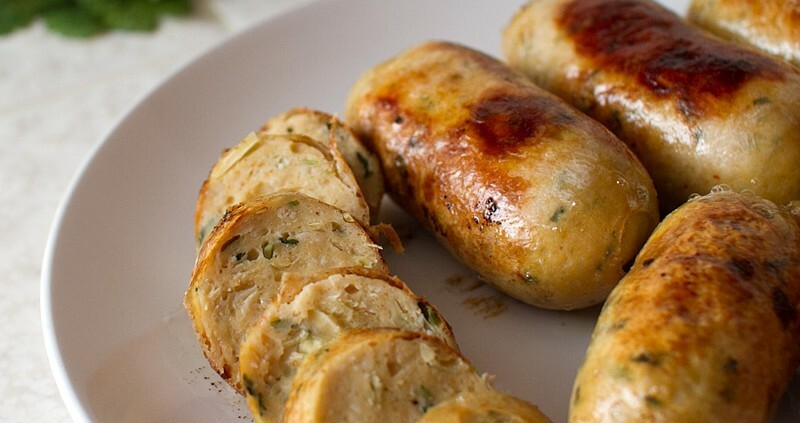 It’s the fat that keeps a sausage juicy and delicious. 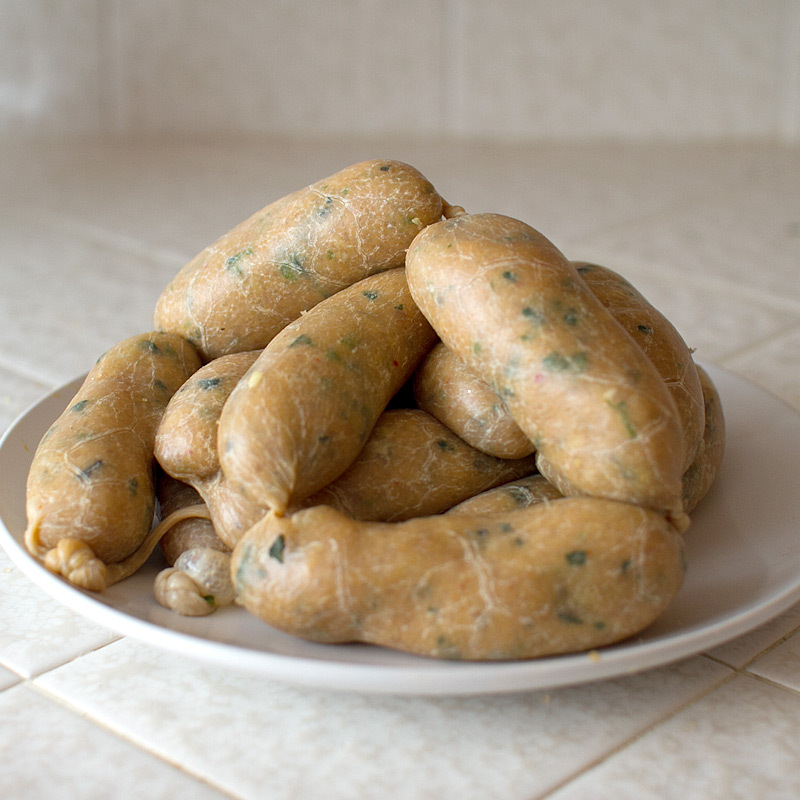 Without the fat (or a fat replacement), the sausage can become dry, and who wants a dry sausage? Not nobody. In lieu of adding additional fat or using thighs, I kept the skin on the chicken breast and added 1 oz (~1/4 cup) of tapioca starch. The starch binds with the water molecules in the chicken and helps keep it moist and juice. I’m not sure of all the technical science behind it, but YAY FOR SCIENCE. It totally worked. I did some rough calculations on the nutritional value of all these ingredients combined, and if you form 10 links total, it comes out to approximately 110 calories, 4g of fat and 4 carbs per link. 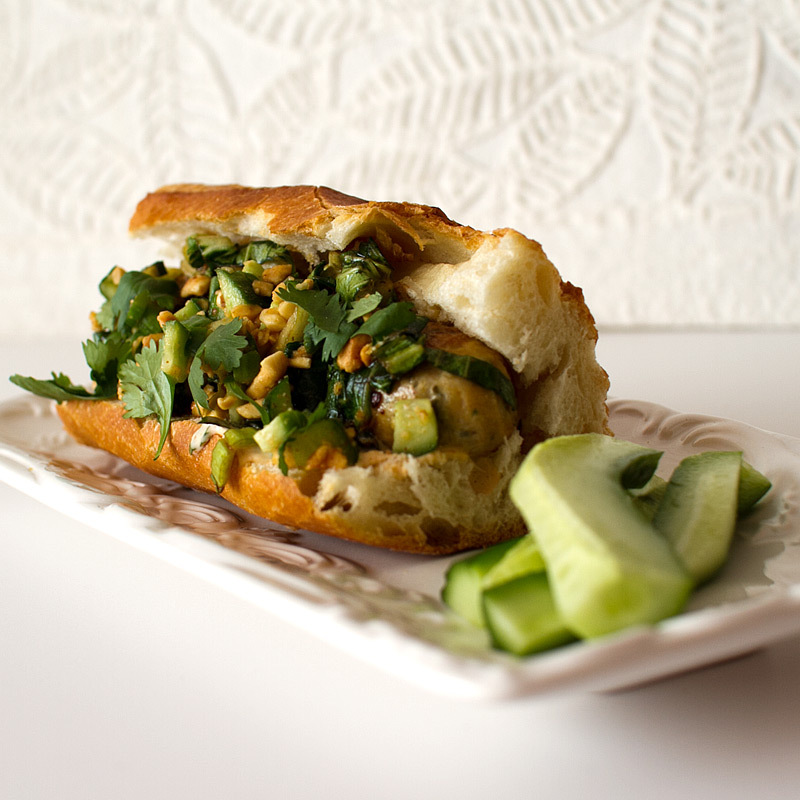 I served the sausages as a sandwich along with a whole bunch of delicious condiments – panang curry mayonnaise, bok choy salad and a cucumber and peanut relish. You’ll find those recipes below as well. 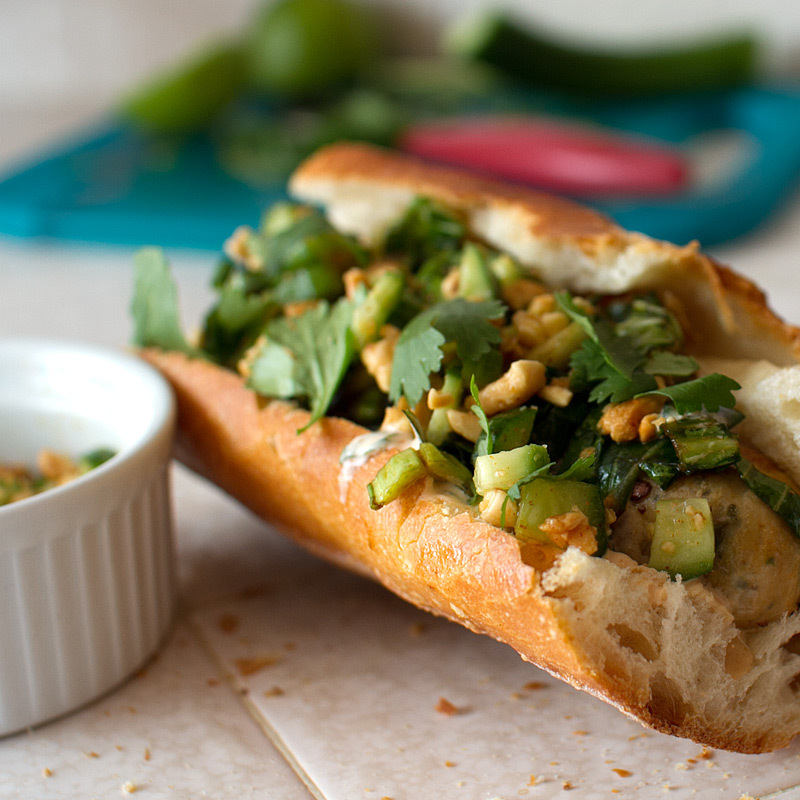 You don’t need any of these condiments by the way, but the cucumber and peanut relish is awwwweeesommmme – it’s cool and refreshing and helps tone down the spiciness of the sausage. 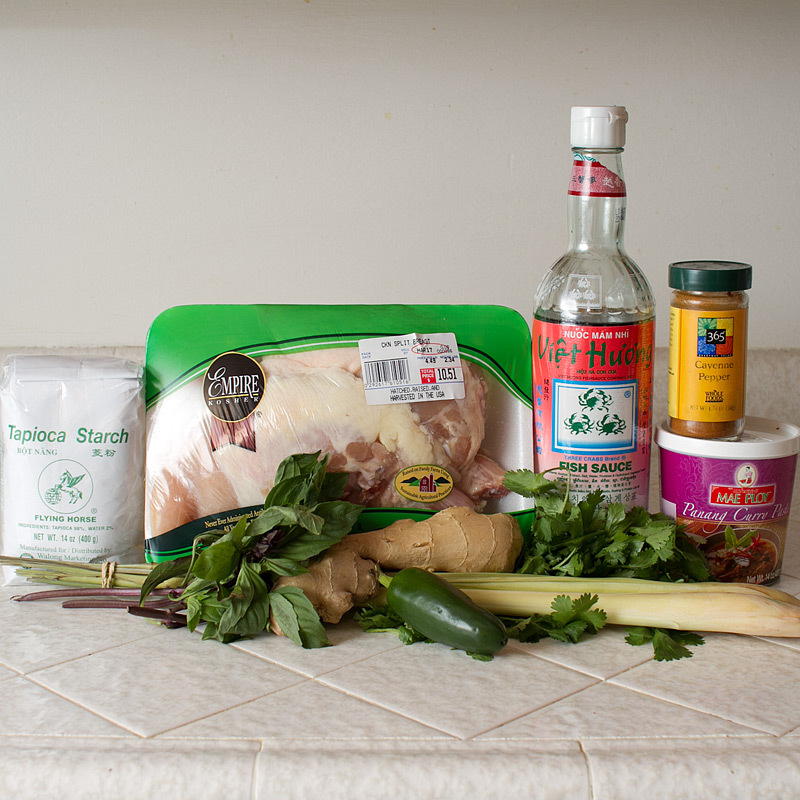 You’ll need chicken breast, fish sauce, cayenne pepper, panang curry paste, cilantro, lemongrass, jalapenos, ginger, Thai basil and tapioca starch. Remove the bone from the chicken and chop into 1″ cubes. Place the cubed chicken on a plastic wrap-lined plate and freeze until firm, about 30 minutes. This makes grinding easier. 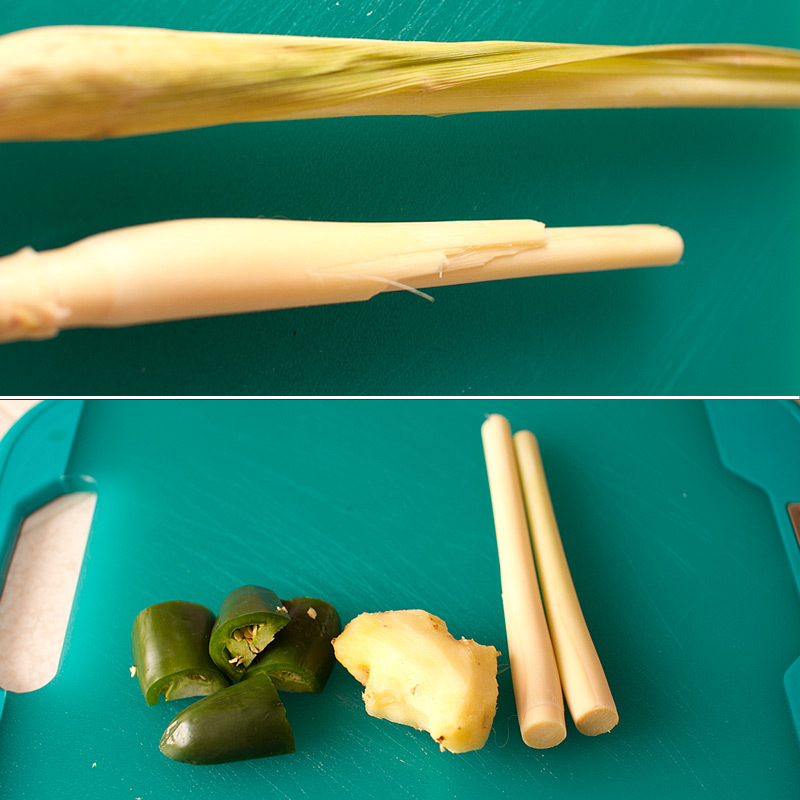 Remove the tough, green exterior leaves from the lemongrass – we only need the tender white part. Roughly chop the lemongrass, jalapenos and ginger. 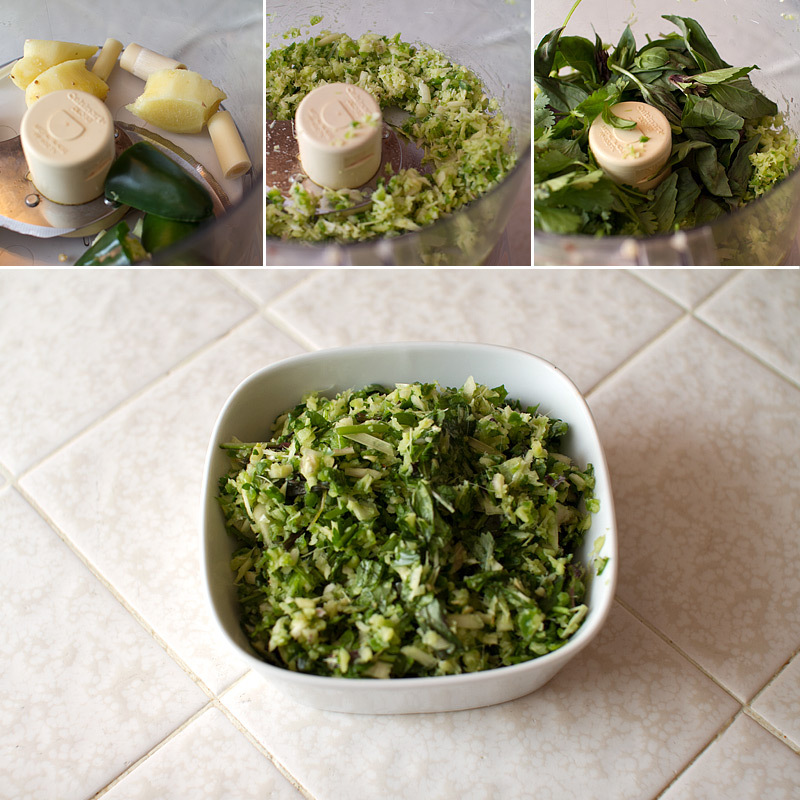 Place the ginger, lemongrass, jalapenos and garlic into a food processor and process until finely chopped. Add in Thai basil and cilantro, and pulse until chopped – about 5 pulses. Set aside. Grind the chicken breast using a coarse grind. To the ground chicken, add the panang curry paste, fish sauce, cayenne pepper and lemongrass mixture. Mix gently to combine. Add in tapioca starch and stir to incorporate. Fry up a small patty and taste. Does it need more salt? More pepper? More fish sauce? Adjust to your liking. Now comes the kinda not so pretty making sausage part. You can bypass this step and just form your sausage into patties. You’ll need hog casings. You can find them at butcher shops or Amazon. They come packed in salt and kind of smell like cat food. Sorry. 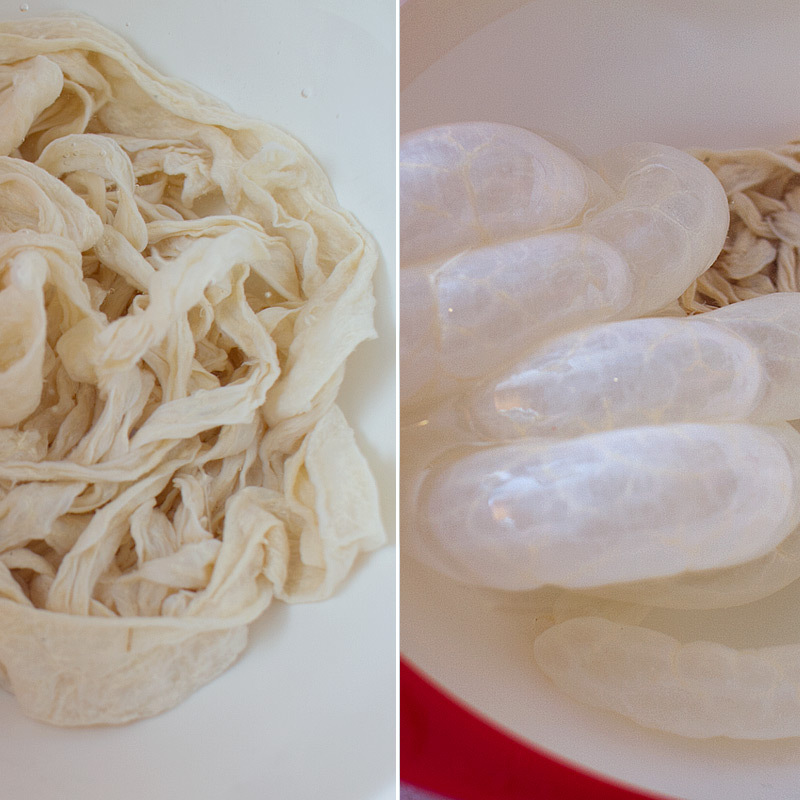 Soak the casing in warm water for 30-45 minutes. Find one end of the casing and open it up to flush water through the entire length. It’ll expand like the picture on the right. Place a little vegetable oil on the stuffing attachment to ease in placing the casing on. Feed the casing onto the stuffing attachment by gently gliding it with your fingers. Tie a knot at the end of the casing and poke a small hole at the end by the knot to release any air bubbles that may occur. …while using your other hand to support the sausage coming out of the other end. Look at us, making sausage!!! 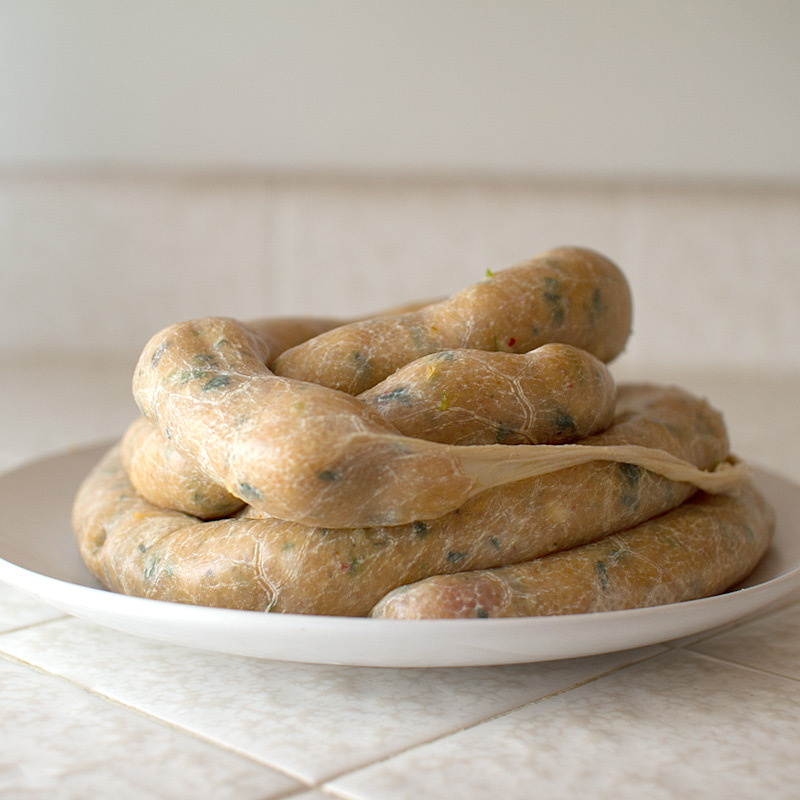 After all of your sausage is stuffed, tie off the end, leaving enough room to account for twisting the links. 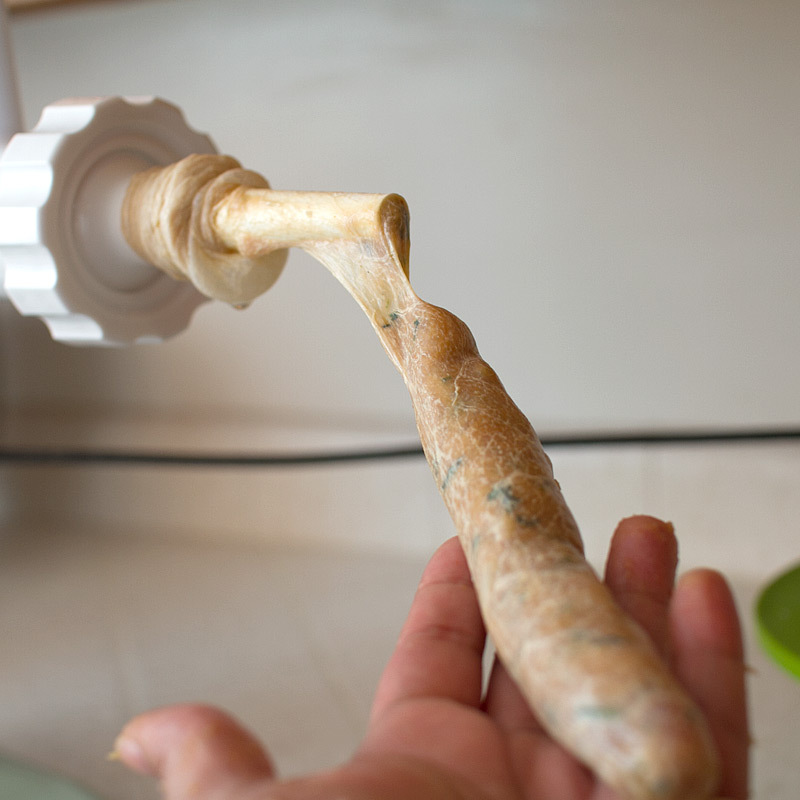 Every 4-5″ inches (depending on how large you’d like your links), pinch the sausage and twist 3-4 times. Repeat this down the entire length. 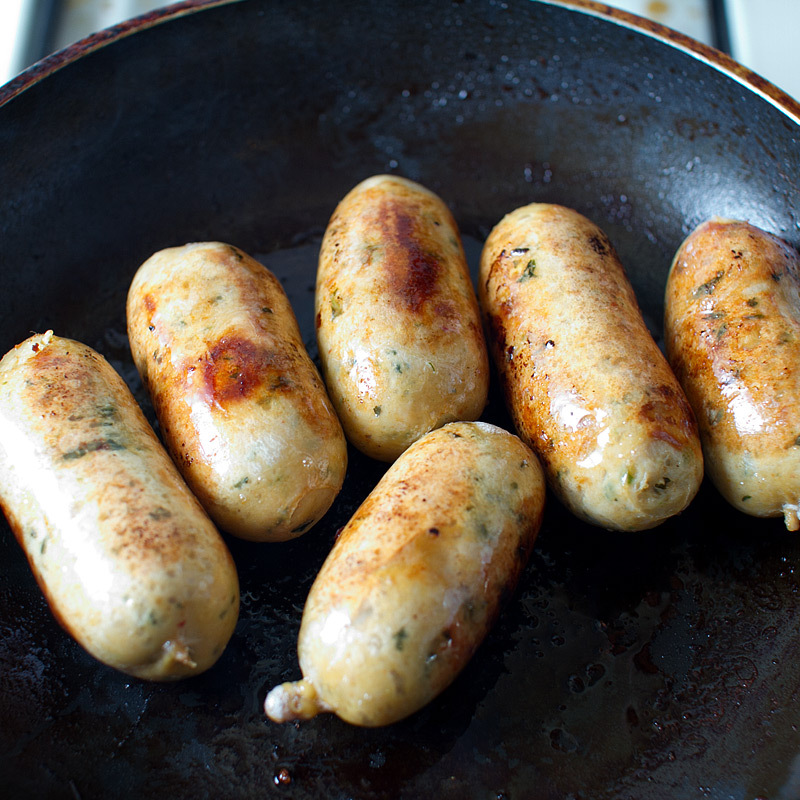 To cook, place the sausage in a heavy pan with 1/2 cup of water. Prick the sausages so they don’t burst while cooking. Bring the water to a boil, then cover and let cook over medium heat for 10 minutes. 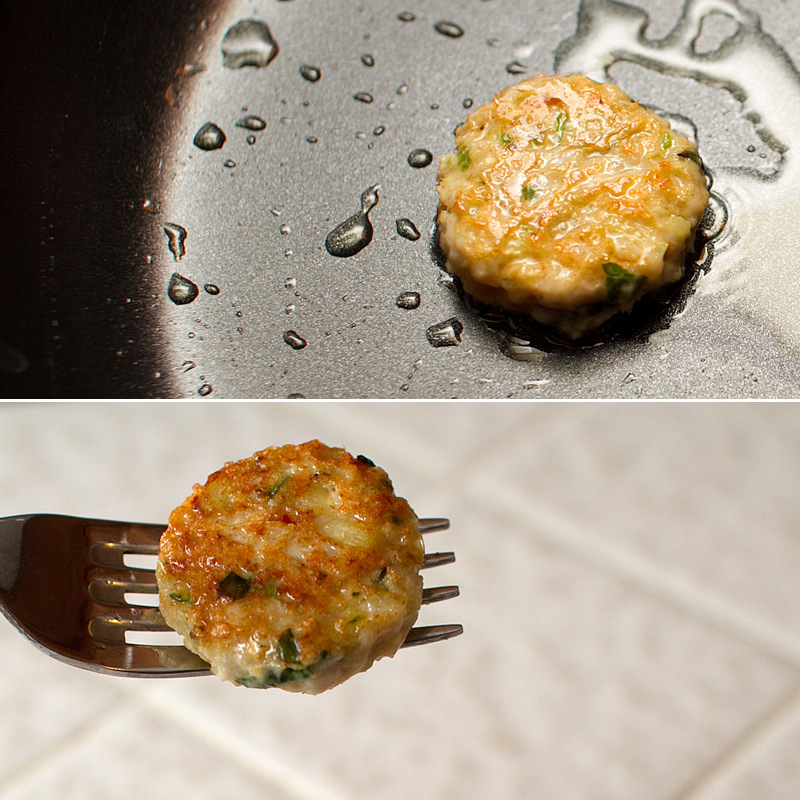 After 10 minutes, remove the excess water from the pan and add 1 tablespoon of oil. Brown the sausage on all sides. It should have an internal temperature of 165F to ensure it’s cooked through. It’s actually still quite juicy for being all chicken breast! Thanks, tapioca starch! 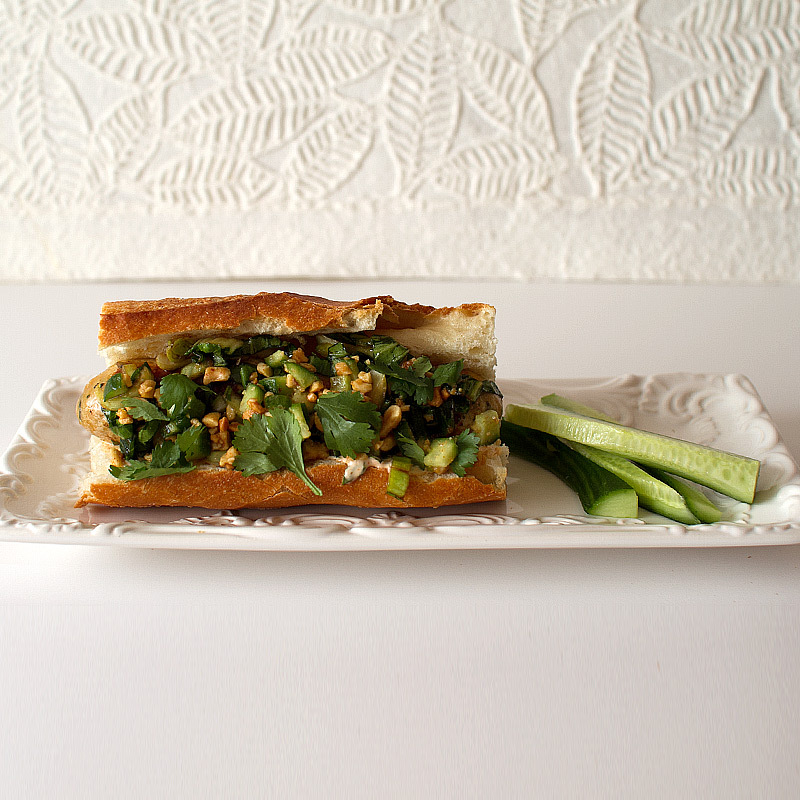 I wanted to eat this as a sandwich with a few special condiments – bok choy salad, cucumber and peanut relish and panang mayonnaise. 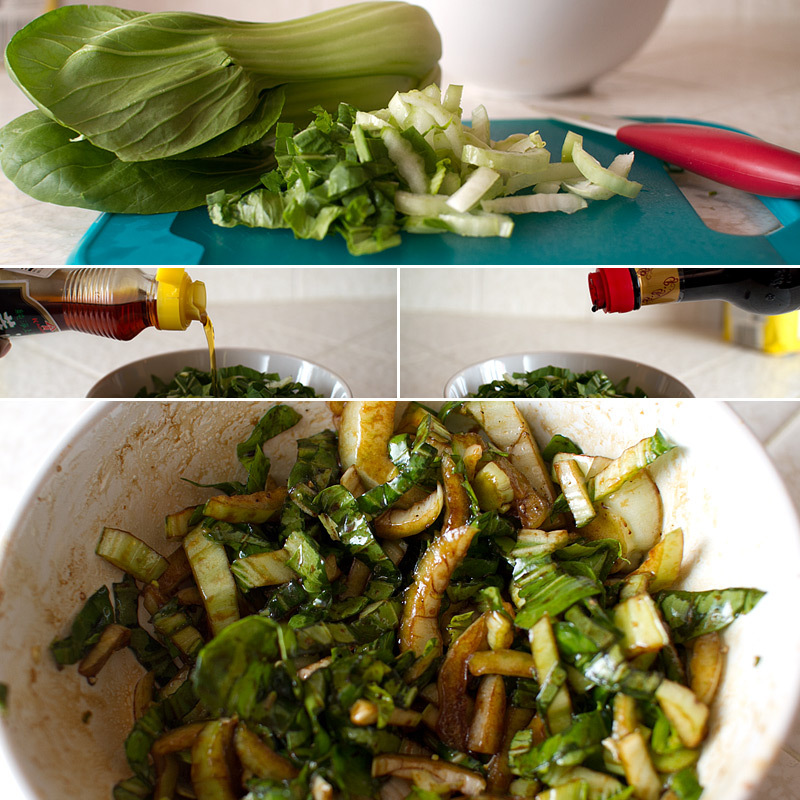 For the bok choy salad, thinly slice bok choy and dress with a bit of sesame oil and soy sauce to taste. Toss to combine and set aside. 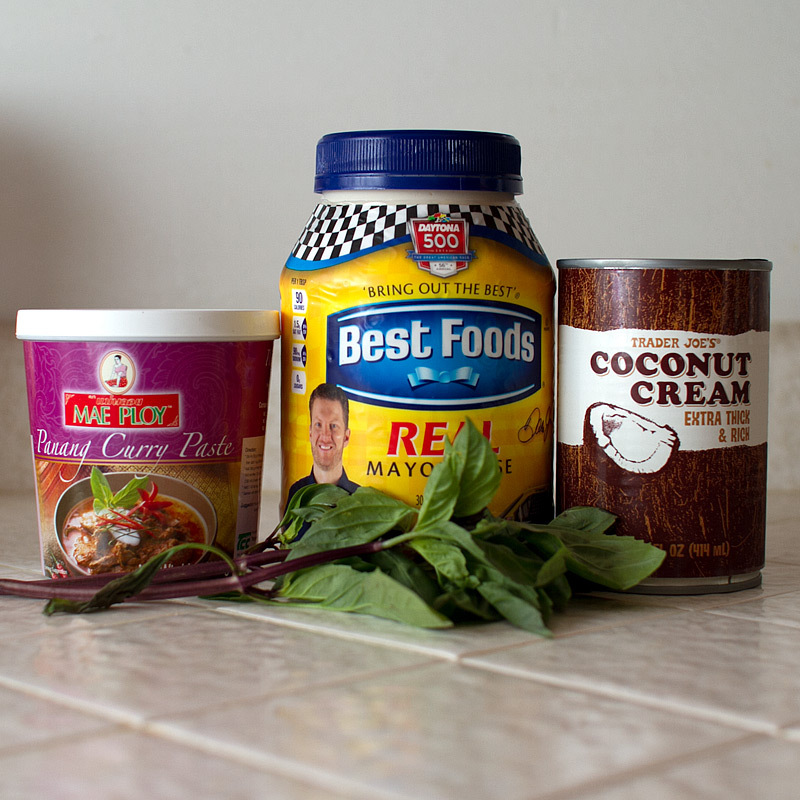 For the panang curry mayo, you’ll need panang curry paste, mayonnaise, coconut milk and Thail basil leaves. Chop the basil and combine with all of the other ingredients. That’s it! Dice one small Persian cucumber. Crush a couple of tablespoons of peanuts and add in vinegar, sugar, a dash of cayenne and fish sauce. 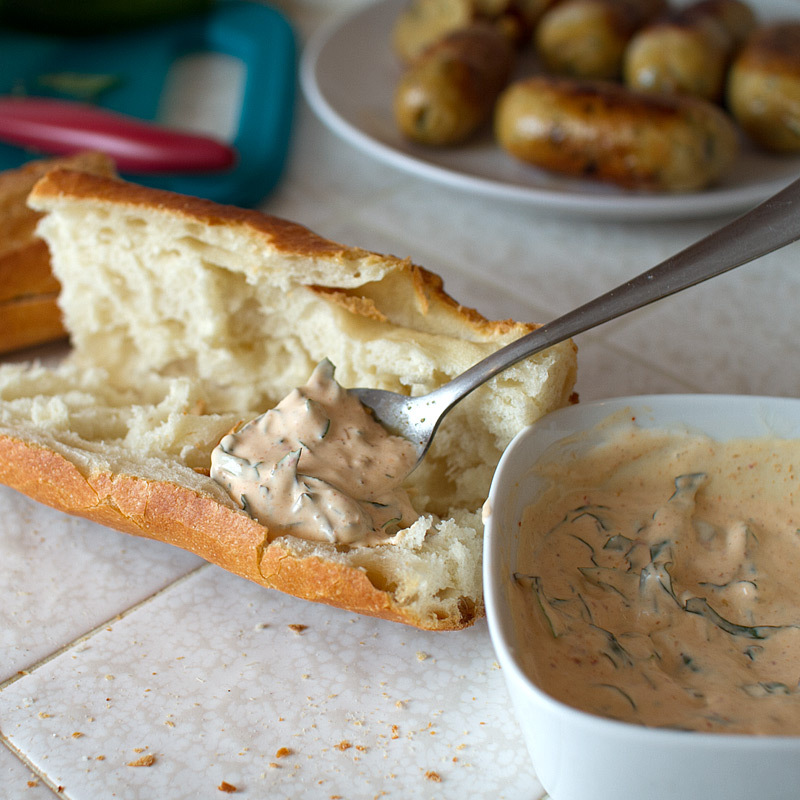 Spread some of the panang curry mayo over a baguette, cut in half lengthwise. Place two sausage links inside. 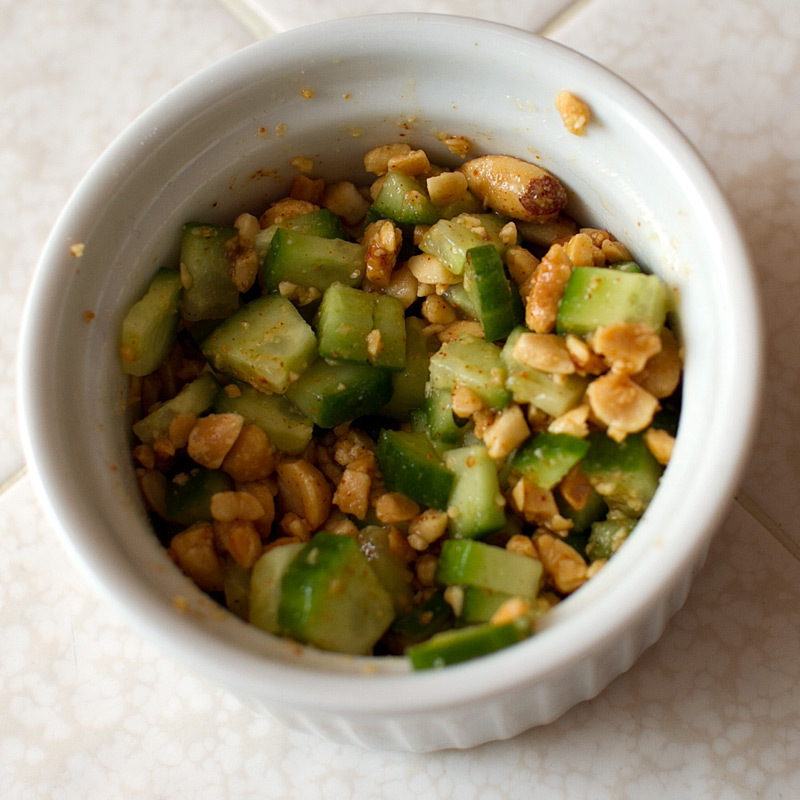 … and some spicy cucumber and peanut relish! Cut chicken into 1″ cubes and place on a plastic wrap lined plate. Freeze 30 minutes, or until firm. While the chicken is in the freezer, prepare the lemongrass mixture. 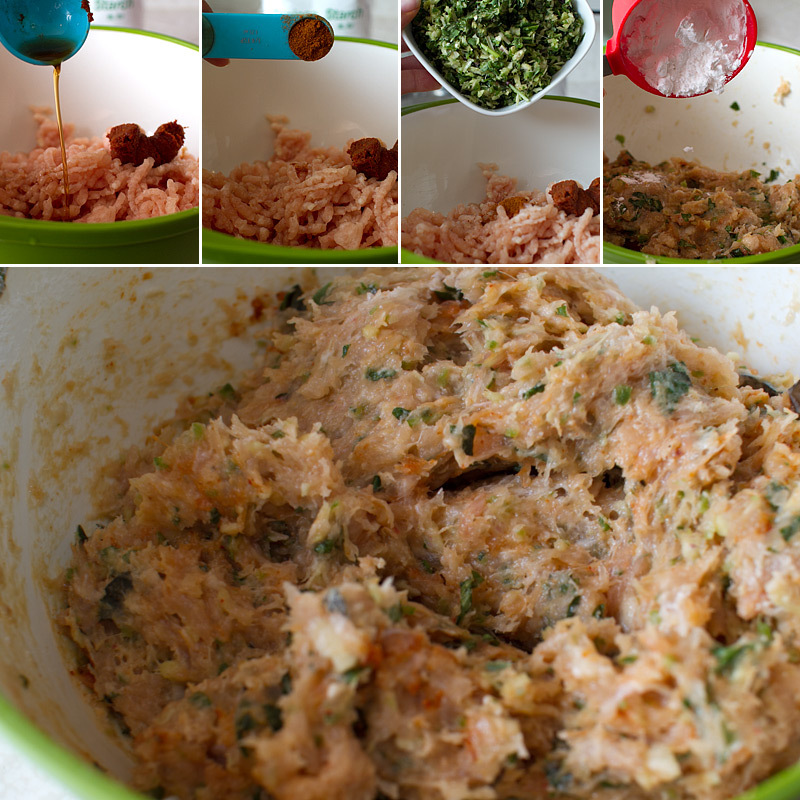 In a food processor, add lemongrass, garlic, ginger and and jalapeno. Process until finely chopped. Add in cilantro and Thai basil, and pulse until chopped. This doesn’t need to be a paste-like consistency, just a really finely chopped mixture. Once the chicken is partially frozen and firm, grind in batches through the course grinder plate. To the ground chicken, add in lemongrass mixture, curry paste, cayenne pepper and mix thoroughly. Add in tapioca starch and mix. Cover and refrigerate at least 30 minutes to allow flavors to blend. Before stuffing the casings or forming patties, cook a small amount of the sausage mixture to make sure the seasoning is correct. I ended up adding a bit more salt. Once the seasoning is to your liking, proceed to stuff or form patties. Form the sausage into 4-5oz patties. That’s it. You’re done. Fry them up in a skillet over medium until the meat reaches an internal temperature of 165F. Rinse off excess salt and soak the casing in warm water for 30 minutes. 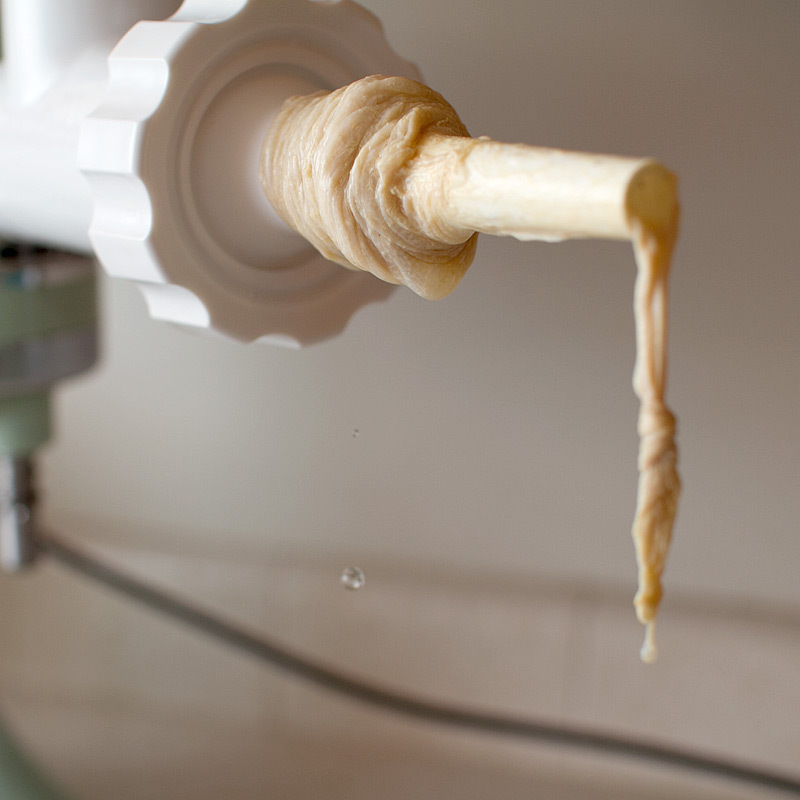 After soaking, flush the casing with water by opening one end and letting water flow in and out the other end. Do this a couple of times to be sure all of the extra salt has been rinsed from the outside and inside of the casing. Place the casing on the stuffer attachment by slowly and gently gliding it along the tube with your fingers. Tie a knot at the end of the casing. 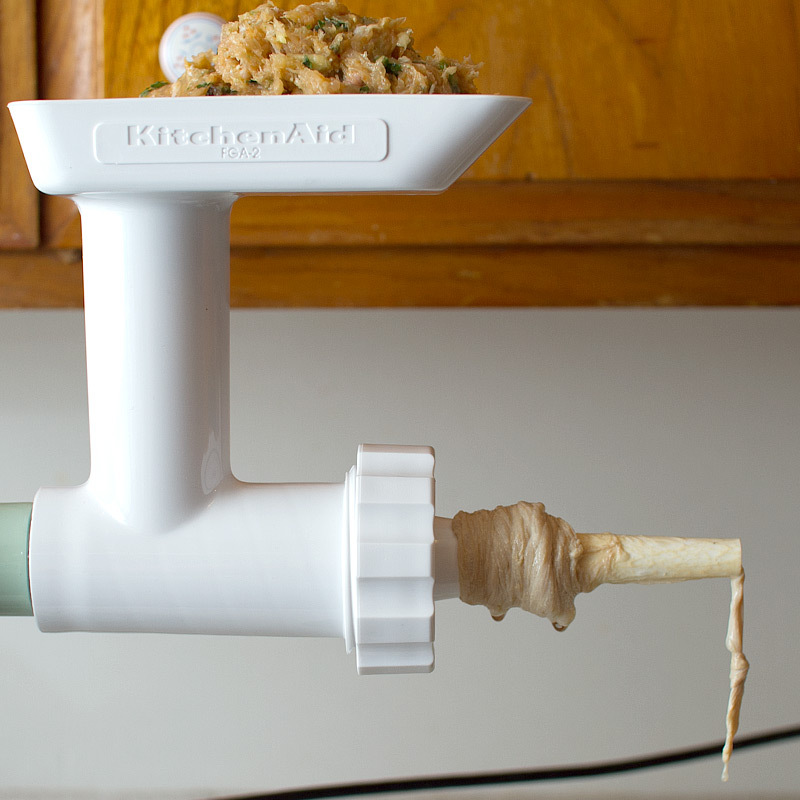 Place the ground chicken mixture in the hopper and slowly push down with the push attachment, while using your other hand to support the casing and meat on the other end. This will take some getting used to, but eventually you’ll develop a rhythm and get a feel for how the stuffer works. You don’t want to stuff the casing so much that the sausage bursts when cooked, but you don’t want it so loose that there are air pockets in the sausage. Again, you’ll get a feel for it after some trial and error. 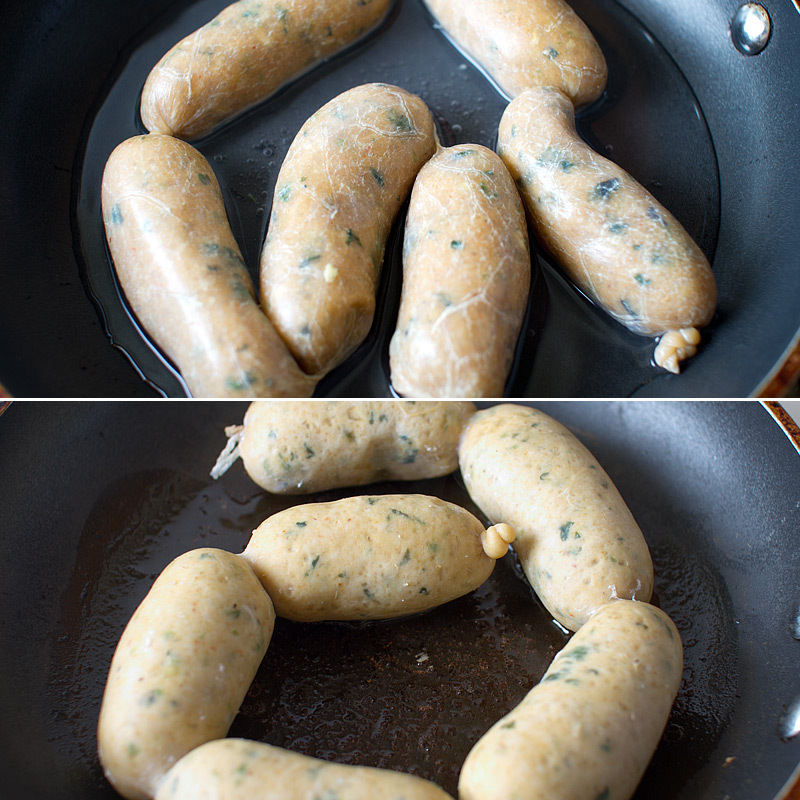 Leave enough unused casing at the end of your sausage to accommodate twisting the links. 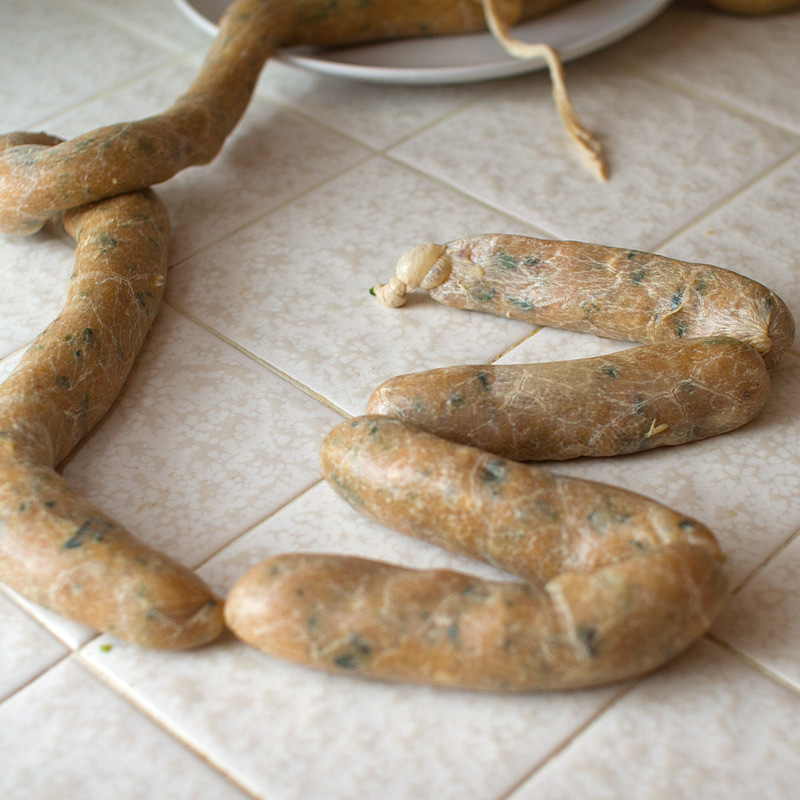 Twist in ~5″ links by pinching a section of the sausage and twisting 3-4 times. Continue down the entire link and knot or tie off the end with twine. Place the links in a heavy skillet with 1/2 cup of water. Prick each link so they don’t burst, then place a lid on the pan and cook for 10 minutes. Pour off the excess water and add 1 tbsp of oil to the pan and brown on all sides. The internal temperature of the sausage should be 165F. 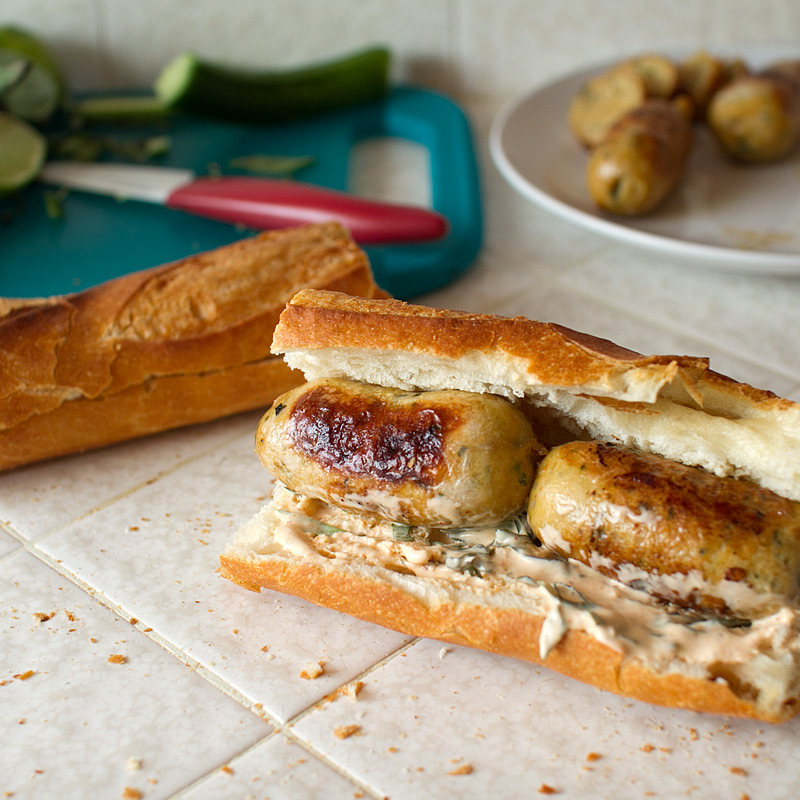 Slice a baguette (long enough to hold 2 sausage links) in half lengthwise. 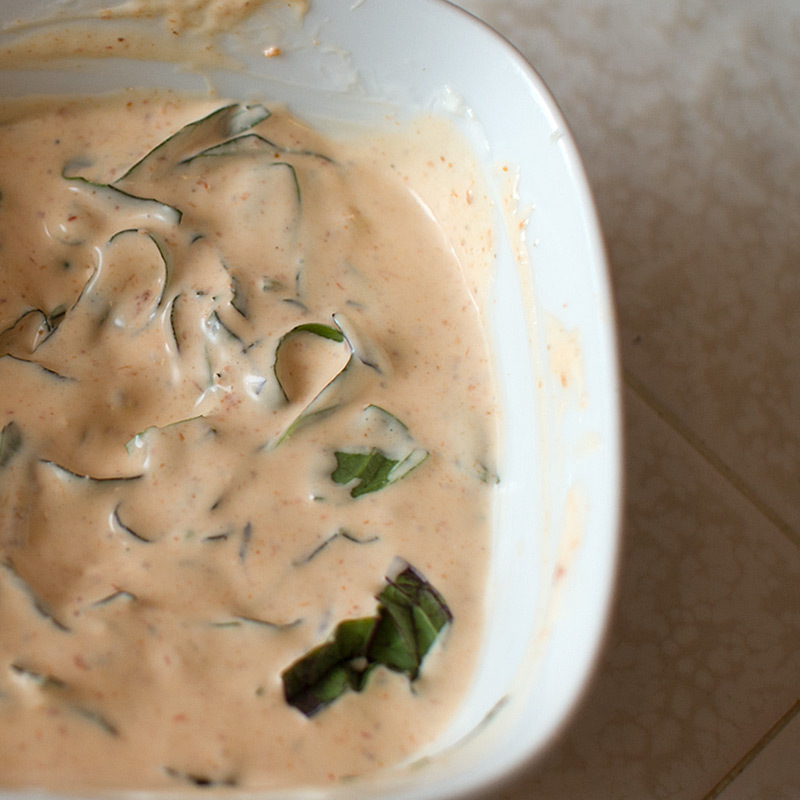 Spread the panang curry mayonnaise on one side. 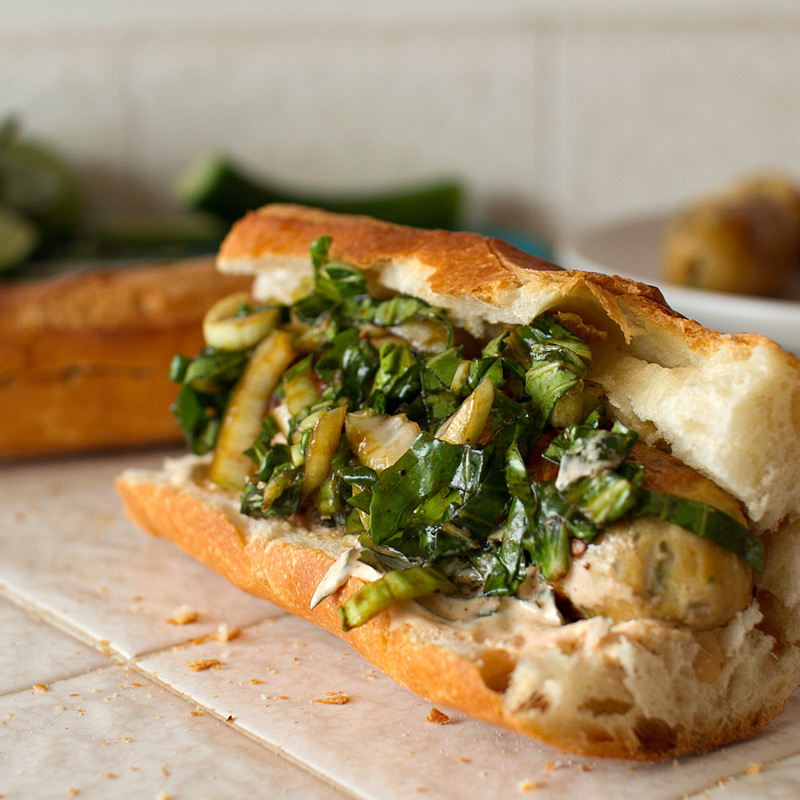 Place two sausage links over the mayo, and top with bok choy salad (recipe below) and peanut and cucumber relish (recipe below). Mix all ingredients together. Add more sugar, vinegar or fish sauce to taste. 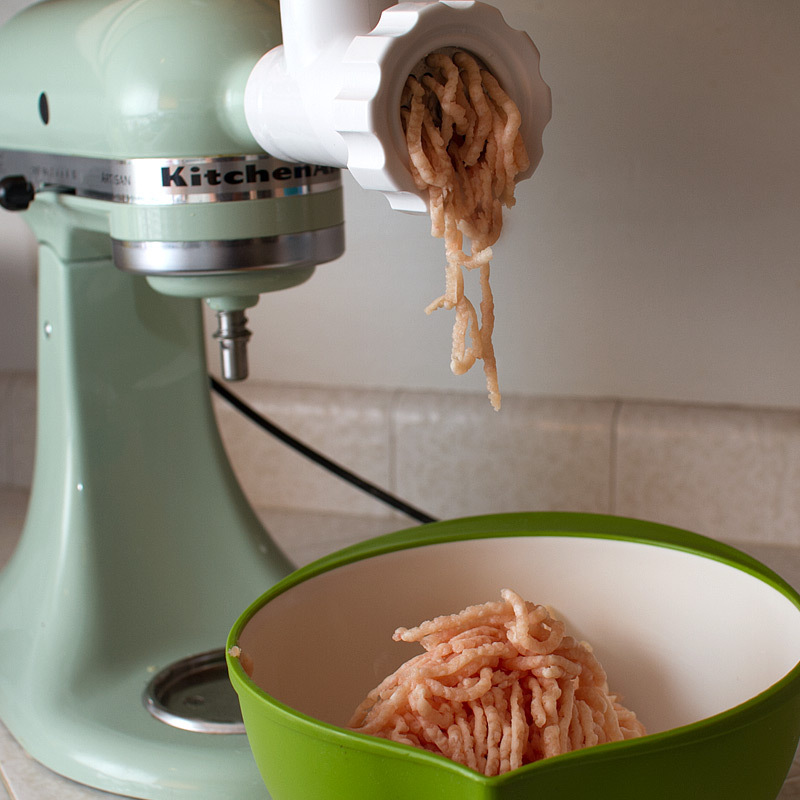 No meat grinder? 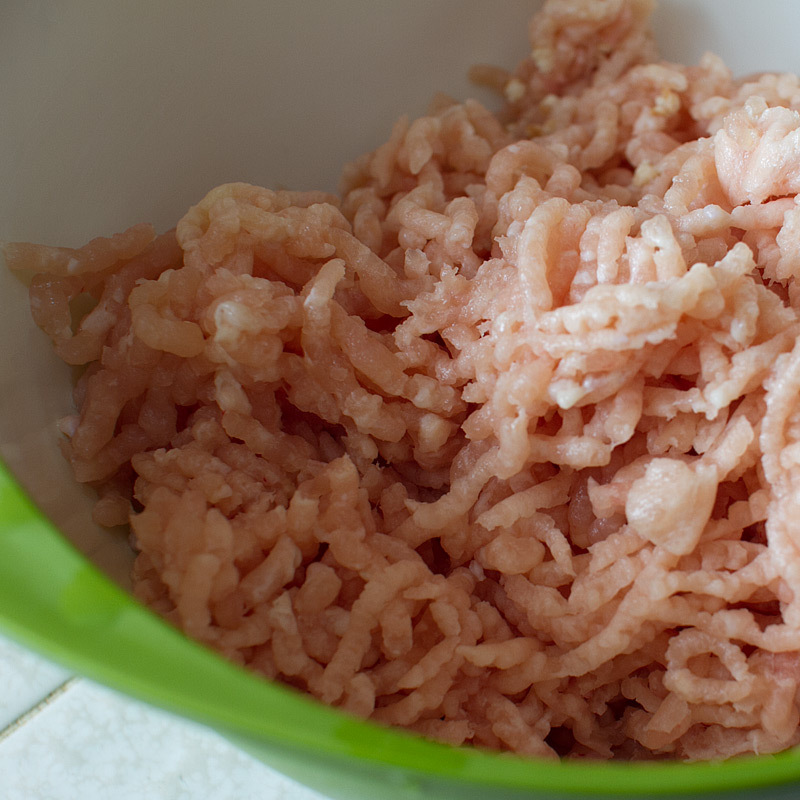 No problem – buy ground chicken from the grocery store. If you store doesn’t have ground chicken readily available, ask the person at the butcher counter. They’re there for more than just placing pre-packaged meat on a shelf. Or, if you have a food processor, run the frozen chicken cubes through in small batches. No sausage stuffer? No problem – form the meat into patties and fry them up. 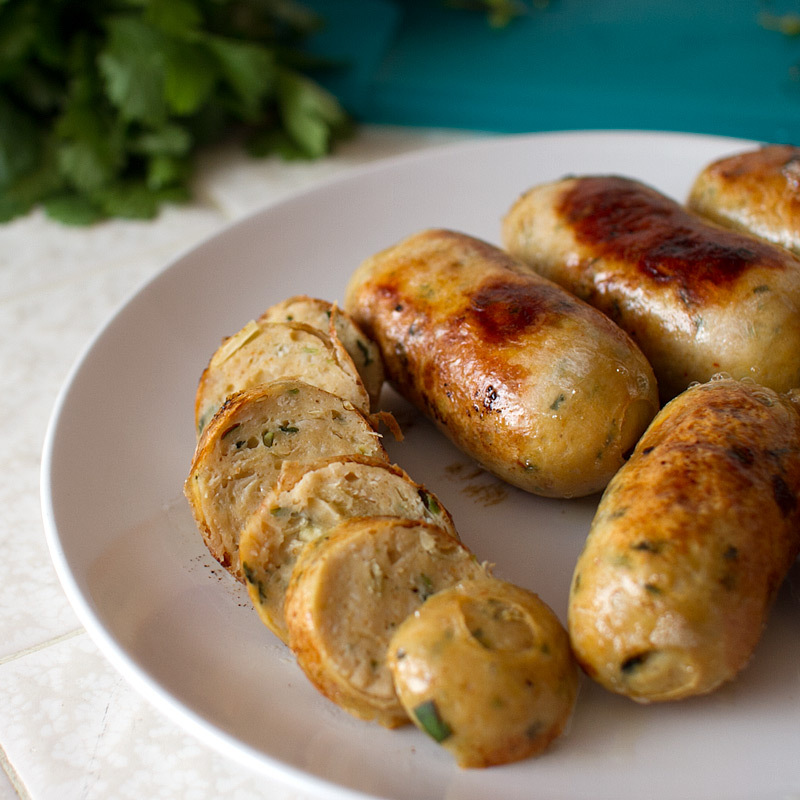 If you really want a sausage inside of casing, check out this tutorial on stuffing casings with a Chinese soup spoon! It’s kinda healthy! I did a rough calculation of the nutritional value of all the ingredients, and if you make 10 links, it comes out to about 110 calories and 4g of fat per link! Not too shabby! 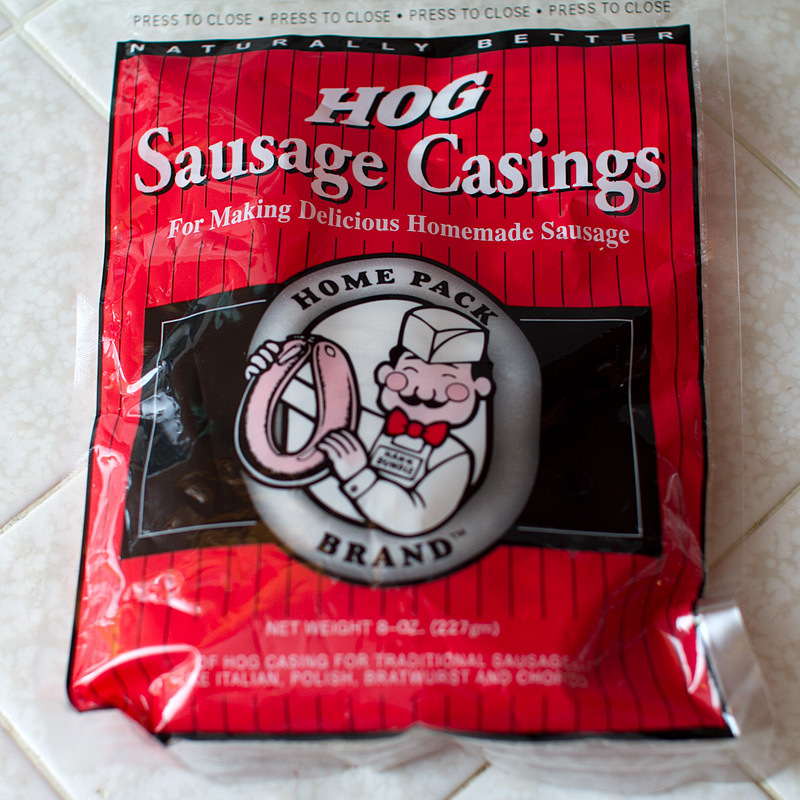 You can find sausage casings on Amazon or your local butcher shop. Girl! That looks so good!! !